My frost free refrigerator is not cooling properly. What might be the problem? The first thing to understand is that all the cooling in a conventional frost free refrigerator usually originates in the freezer compartment, just a small portion of that air is circulated through the fridge compartment to cool there. (Technically the opposite is true. Warm air is circulated into the freezer compartment where its heat is removed by the refrigeration process leaving behind cooled air.) In any case, if that air flow is hampered in any way, cooling problems will result. The second thing you need to know is that the compressor (large black dome at the rear of the refrigerator) provides all the cooling ability for the whole appliance. It has to be running in order for any cooling to take place. As long as the compressor is running, the possibilities listed below will need to be checked one at a time. If the compressor is not running or continually trying to start but failing within seconds, clicking and then shutting down, someone will need to look into why. That alone is likely the cause of your cooling problems. There are lots of things that can cause cooling problems. 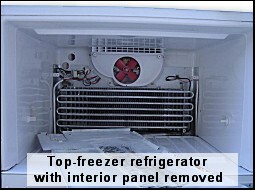 One of the most common causes of poor cooling in a frost free refrigerator is a defrost system failure. In such a case one or the other compartment may appear to be keeping proper temperature but that too may change in a short period of time. The fridge compartment's temperature rise is usually (but not always) the first to be noticed. Note: The compressor should usually be running whenever any of the fans (evaporator fan in the freezer and condenser fan by the compressor) are running. All should run together while the refrigerator is in cooling mode. There is a difference between "frost" (a white, snow-like substance) and "ice" (usually clear and solid). When referring to what is seen during an inspection, please keep this distinction in mind as the possible causes for each are often very different. The defrost system on a frost free refrigerator consists of some kind of timing device (often a mechanical timer), defrost heater(s) and a defrost termination thermostat (a.k.a. defrost limit switch). The timer acts like a clock to automatically switch the refrigerator from cooling mode into the defrost cycle. After a period of time it then switches the refrigerator out of the defrost cycle back into the cooling mode again. When the defrost heater is switched on during the defrost cycle, it melts any frost build up which has accumulated. The defrost limit switch shuts the heater off when it senses a set temperature which should indicate a totally defrosted evaporator. Defrost timers frequently fail and stop keeping time. If this happens during the cooling mode, it will allow excessive frost to accumulate on the cooling coil reducing air flow, eventually stopping it altogether as it never switches into defrost mode to melt it. The timer can also stick in the defrost mode and never advance into the cooling cycle again. The defrost heater contacts of the timer or the defrost heater itself can burn out leaving the defrost circuit open. In this case even if the timer advanced into the defrost cycle, the heater would not produce any heat to defrost the evaporator coil. The timer then goes merrily on its way back into the cooling cycle, effectively accomplishing nothing. More frost builds up, eventually to the point of totally plugging the cooling coil. The defrost termination thermostat opens the circuit to the heater when it senses a set temperature. This set temperature is usually high enough that the cooling coil should be totally defrosted by then. If this device fails and remains permanently open, the heater would never get power to defrost the evaporator. If the defrost termination thermostat contacts short out, it will allow the defrost heater to stay on as long as the timer is in the defrost mode. A symptom of that is usually greatly fluctuating temperatures in the freezer compartment possibly causing thawing and re-freezing of food stuffs. The defrost timer can also fail so that it powers both the cooling and the defrost circuit at the same time. This can cause both the fridge and freezer section to not cool properly and will likely be noticed most in the refrigerator section. The freezer temperature can alternate between cooling normally and not quite enough. This type of failure doesn't happen very often. The hot side of the refrigeration system is called the condenser. This is where the heat from inside the fridge is released into the room air. 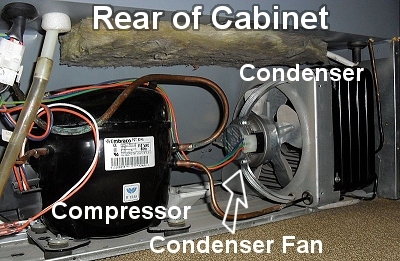 Many newer models have a fan by the compressor to move air through the condenser. This design is called a "forced air condenser". Its purpose is not to cool the compressor but instead to move air through the condenser. The condenser fan motor and/or its blade can develop problems. It should be checked to ensure it is operating and at full speed whenever the compressor is running. The condenser itself can also become plugged with dust and dirt to the point where very little or no heat transfer can take place. It should be thoroughly cleaned several times a year to avoid cooling problems and keep the appliance running as energy efficiently as possible. Specially designed condenser coil brushes are available for this job. A problem with the condenser side of the refrigeration system can sometimes also manifest itself as an unusually hot mullion strip between the two refrigerator doors and/or around front perimeter of the refrigerator's cabinet. 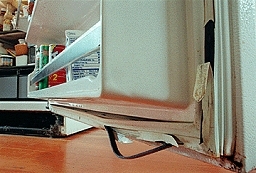 Those areas are often heated by tubing incorporated into the refrigerator's cabinet which is part of the refrigeration system's condenser loop. If the main condenser can't off-load the refrigerant heat normally, that heat will migrate to those areas of the cabinet causing unusually warm temperatures there. On all frost free refrigerators there is a fan in the freezer section which circulates the air throughout the whole appliance. That fan is called the "evaporator fan" and should usually be running whenever the compressor is running. If that evaporator motor should fail to function, proper temperatures will not be able to be maintained. Failures could include the motor winding becoming open, the motor bearing seizing, the fan blade's movement hampered by an excessive frost accumulation on the evaporator coil or the motor running slower than normal because of worn motor bearings which can also result in a squealing or squeaking sound being emitted. Besides hampering air circulation, failure of this motor can also result in an excessively frosted evaporator coil. On many older models, that evaporator fan may stop whenever the freezer door is opened, depending on the design of the refrigerator model and if a door activated fan switch is used. Such a fan switch was eliminated from many never fridge designs as it was a common failure location which would stop cooling of the whole appliance should it fail. Some newer model fridges (Amana, Frigidaire) and even some older models (GE in particular) run power for the evaporator fan motor through the defrost heater and defrost limit switch. If either of those components should fail, the fan may stop circulating cold air through the entire refrigerator cabinet. Still newer refrigerator models may use multi-speed DC motors which are electronically controlled. Refrigerator models of late may utilize an automated air damper system to control the flow of air between the two compartments. Such designs can experience problems with a motorized damper and if employed, may be suspect for either limited cooling in the fridge compartment or freezing temperatures there. On most older models the air damper system is manual, adjusting an air duct 'flapper' by turning one of the control dials. These older systems were rarely the cause of problems without having been physically tampered with in some way. The water that is recovered during the defrosting of the evaporator is funneled to the moistral pan under the refrigerator. The drain trough in the freezer compartment below the evaporator which catches that water can get plugged with food residue, etc. and ice, causing the water to back up and freeze there. This ice blockage can hamper the air flow from the freezer section into the refrigerator compartment, causing warmer temperatures in that compartment. Many recent top-freezer fridge models have had design problems in this area. If you experience this on a newer top-freezer fridge design, you should consider having a *factory authorized* technician see if any design modifications are necessary on your model to correct this occurrence. Poorly sealing door gaskets can allow more warm and humid air into the appliance than can be removed effectively. This will often lead to excessive frosting of the evaporator coil that even a properly operating defrost system can not handle. This could also cause condensation to appear on areas on the interior like the compartment ceiling or inner door panel or on food packages. A light in either the refrigerator or freezer compartment could be staying on even when the door is shut. The door activated light switch can usually be pressed manually to ensure it is still functioning and not shorted. Make sure food packages inside the freezer and fridge sections are not packed so tight that it inhibits air circulation throughout the compartments. Do not block any air vents that may be in the floor or back panel of the freezer. Make sure the fan cover and any air ducts are properly in place and have not fallen off. Lastly, you can check for a refrigeration system problem. This will involve inspecting the evaporator (cooling) coil itself and looking at the frost pattern on it. When operating normally there should be a complete and even frost pattern across the whole evaporator. If only partially frosted (see illustration above) or if it just has just a single ball of ice in one small area, a qualified refrigeration technician will be required to isolate and correct the actual cause. The repair is not the type of a job a homeowner can do them self... nor should even attempt to try. BTW. The refrigerant used in household refrigerators is usually either R12 or in newer fridge models, R134a. "Freon�" (sometimes mispronounced freezone) is just a trade name for a whole line of refrigerant types (R-12, R-22, R-134a, R-502, etc.) from the DuPont company, not just that which is used in household refrigerators and freezers. Other refrigerant manufactures have their own brand names that they market their refrigerants under.